Pretty Good Number One is now available from most major ebook stores, including Kobo, Amazon, and iBooks. And it’s doing great: it’s been the #1 bestseller in Japanese travel on Amazon for most of the last week. He’s clearly a Japanophile as well as an appreciator of good food at low prices and lovingly describes, along with eel backbones and chicken livers, great food from 24-hour convenience stores, ramen-ordering systems (you pay before you even enter), inadvertently sitting down on restaurant tables rather than on the seats, sending his eight-year-old out to run grocery errands unaccompanied (I was particularly tickled to revisit Iris, who often offers sage commentary such as “If you’re a sumo wrestler, you can do whatever you want. And if someone doesn’t like it, squash goes the person”) — but with a wry self-awareness that shares his fascination rather than over-saturate readers with it. For this book, it was a long list. I wanted to avoid unexamined stereotypes, the phrase “the real Japan,” any indication that I really understand Japanese culture, misuse of Japanese vocabulary, and so on. Basically, I wanted to steer clear of anything that would make a reader with a Japanese background say, “Hoo boy, another white guy who thinks he knows everything.” The early reviews suggest that I’ve done okay. Phew! Some fun blog and media coverage is coming up, plus an enormous post about some of the technical aspects of ebook production, but for now I just wanted to say thank you again for being my most faithful readers and for helping to make this little book a success. This entry was posted in Uncategorized on April 17, 2013 by mamster. Hey, remember last summer when Laurie and Iris and I went to Tokyo? And remember when I hit you up for money to edit, design, and publish a book about our adventures? 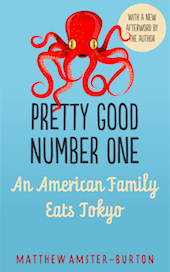 That book, Pretty Good Number One: An American Family Eats Tokyo, is available RIGHT NOW. You can buy it on Amazon for Kindle (or the Kindle app for iPad, phones, PC, Mac, etc). If you prefer a PDF to read on your computer or print, you can buy it on Scribd. It’ll be on the iBooks, Kobo, and Sony stores soon (I’ll let you know as soon as it is). No matter where you buy it, it’s $5 for a 240-page book, and almost nothing in it is previously published. 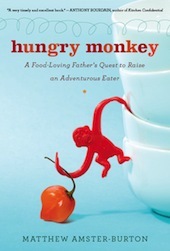 If you’re a Roots and Grubs reader, you’re going to love this book. I’m, like, 99% sure of it. It’s loaded with food, jokes, and stories, like the time we were waiting in line at an eel restaurant and…well, just read the book, okay? Please? This entry was posted in Uncategorized on April 9, 2013 by mamster. Hey, everyone. Sorry if you’ve already seen this, but my new book–the one I hinted about last July while we were in Tokyo–will be out in June as a full-length ebook (and, a little later, an audiobook). Click here to donate, or to just watch the video and read the complete first chapter. Help fund a US book tour. Want me to come read in a city near you? You know what to do. Sorry for the blatant commercialism. If you read this blog, I suspect you’re going to love the book, and dozens of you have already donated. Thank you so much for your support. This entry was posted in Uncategorized on February 27, 2013 by mamster. Few people drive to work in Hong Kong. Owning a car is absurdly expensive and generally restricted to the rich, though the rich are not in short supply here. One day I took the bus to Shek O beach along a stomach-churning mountain road in the southeast corner of Hong Kong Island. At one point, the road was narrowed to one lane by a rockslide, and flaggers controlled the flow of traffic. As the bus passed through, I saw at the head of the line, waiting to travel back into town, a shiny black Rolls-Royce. Most people, however, get to work (or the beach) by subway, ferry, bus, tram, or…escalator. The Mid-Levels Escalator is the world’s longest escalator complex. It runs up the slope of Victoria Peak through the Soho and Mid-Levels neighborhoods for about half a mile, cutting a perpendicular swath along dozens of small streets, each sporting shops, indoor and outdoor restaurants, butchers and vegetable sellers. The escalator runs downhill in the morning for commuters coming down the mountain and uphill the rest of the day because the Peak is really, really steep. The escalator is one story above the street, and at every intersection you can hop off and walk down to street level or, usually, into the second floor of a building. Just when I was getting thirsty, the escalator opened directly into the second floor of a Wellcome supermarket, where I bought a bottle of green tea and browsed the fresh noodle section. 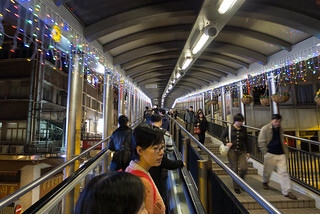 Although it’s lit up at night and serves some of HK’s wealthiest neighborhoods, the escalator is anything but deluxe: it’s well worn (55,000 people ride it daily) and feels like a reliable old Honda Civic. As a people mover, the escalator works like a streetcar: not built for long distance travel but for extending your walk beyond the point where you’d usually poop out. Sure enough, I rode the entire length of the escalator (and kept meeting up with it, sometimes unexpectedly, whenever I was on HK side). I popped into a bookstore, bought a notebook, and admired the selection of chop seals, used throughout much of east Asia as an adjunct to handwritten and electronic signatures. I thought about commissioning a chop seal with the Chinese characters for “soup dumplings,” which would probably be a mildly imperialistic thing to do, but if you’re going to reduce a whole culture to three symbols, I can’t think of three more auspicious ones. This entry was posted in Uncategorized on February 19, 2013 by mamster. Note: I’ve put up nearly all of my Hong Kong photos in a public album on Facebook. The view of Hong Kong’s skyline from the 29th floor of a Kowloon skyscraper is almost enough to distract a man from his crispy glazed eel, fish skin salad, and lamb dumplings. On my way to Hong Kong, I flew through San Francisco and enjoyed an aerial view of the Golden Gate Bridge, probably the most beloved piece of architecture in America. What we love about the Golden Gate (and I’m stealing this idea from Christopher Alexander) is not just the bridge itself, but the fact that it takes an already beautiful natural landscape and improves it. Fifteen hours later, I swiped my Octopus card and stepped onto the Star Ferry. The Star Ferry carries passengers across Victoria Harbor, between Hong Kong Island (think Manhattan) and the Kowloon peninsula (Brooklyn). Locals say “Hong Kong side” and “Kowloon side.” The ride takes five minutes, a ticket costs about 30 cents, and you will absolutely freak. Recipe for a world-class skyline: Take one island. Add at least a million people. Add money. Bake a few decades. That’s how you build New York, Singapore, or Vancouver. Okay, downtown Vancouver is a peninsula, but a peninsula is just an island with codependency issues. It’s also how you build Hong Kong, and even if you’ve lived in the city your whole life and slaver over skyline photos like centerfolds, you’ve never seen anything like Hong Kong Island. Its north shore is as exuberantly vertical as Yao Ming, and after fourteen hours of airplane food, it looks not unlike a waiter holding up the city on a platter. So I wandered, hungry, through the nighttime streets of Kowloon. I passed a Disney-like courtyard featuring a massive statue of a teddy bear. Hong Kong has a predilection for ostentatious and aggressively cute public art, and this was my first taste. I walked past anti-Falun Gong propaganda banners and enough neon to bring 24-hour daylight to a small town. Hong Kong is a walking city. Its subway system is excellent, but I mostly used it to travel beneath the harbor between the Kowloon and Hong Kong sides. I walked up through Tsim Sha Tsui (aka TST), the nightlife district that affords further luscious views of the skyline, and passed hundreds of restaurants, mostly Cantonese but also Shanghainese, Western, fusion food, Indian, southeast Asian. Just north of TST is the Jordan neighborhood, where I rented a windowless guest room at Pak Lok Mansions. The word “mansion” has somehow inverted itself in east Asia, where it means a room or apartment that doesn’t require a long-term lease. My room, which I secured through Airbnb, was clean, tiny, and boring, with an in-room shower and toilet, for $40/night. Over on Temple Street, just west of Kowloon’s main north-south boulevard, Nathan Road, is a daily night market that opens in the late afternoon and runs until after midnight. Stalls offer souvenirs, textiles, wallets, cooking utensils, stationery, and incense. Near the south end of the market is a small street food district. At one intersection, competing spicy crab restaurants spill out into the street. I’d like to think of myself as the kind of person who, upon arriving in an unfamiliar city, would sit down with locals and patiently dismantle a whole spicy crab. I am not. I kept walking and had dinner at a chain restaurant. This is no great surrender, honestly. Chains in Asia fulfill the role of chain restaurants everywhere: they’re inexpensive, approachable, reliable, and specialize in some aspect of the local cuisine. What Asian chains add to the equation is really good food. I confirmed this calculus at an outlet of the Tai Hing chain with a plate of “five-star” roast pork, rice, and “healthy vegetable.” The healthy vegetable was Chinese broccoli (gai lan) Hong Kong’s favorite vegetable, steamed until its juicy stalks turned crisp-tender and drizzled with oyster sauce. The roast pork belly, served bone-in at room temperature, had crackly and slightly sticky skin. I intended to limit myself to mostly Cantonese food in HK, but with no one to lash me to the mast and alluring restaurants of all descriptions, I strayed. At San Xi Lou, on the seventh floor of a Hong Kong-side high-rise, I ate the most perfect Sichuanese food: smashed cucumber salad, ma po tofu, and pickled red turnip in chile oil. The chile oil had been cooked just shy of burning, and the cubes of crunchy vegetable were well-oiled, red and smoky, chile-hot and temperature-cold. Afterwards I rode a vintage double-decker tram along Des Voeux Road until lured out by banner with a cute polar bear advertising Hokkaido-Yo frozen yogurt at Circle K. January in Hong Kong is temperate, a lot of 65°F days, not too cold for frozen yogurt. The tram has been ferrying passengers from the foothills to the 1800-foot summit of the Peak since 1926, and it has the appeal, and the click-clack soundtrack, of a classic wooden rollercoaster. I’ve ridden a funicular in Japan, but this one is faster, and the track curves sharply a couple of times on the way to the top. At the summit, if it’s evening you’re treated to that famous view of Hong Kong glowing at night. In the morning, you get Hong Kong cloaked in smog. From the summit, I hiked down a paved trail, past many vigorous-looking elderly Chinese people (and bedraggled tourists and expatriate fitness nuts) hiking up. About halfway down I met up with the Mid-Levels Escalator, the world’s longest escalator complex, which runs downhill in the morning and uphill the rest of the day. This is travel writing practice for me. Is this interesting? Do you want to hear more? This entry was posted in Uncategorized on February 1, 2013 by mamster.